Last year, I wrote an article entitled "Penetration testing market analysis: Where is all the revenue?" looking at the Australian penetration testing market, and estimating the size of the market at $200 - 300 Million. Since then I've had any number of requests to extend the analysis, to answer the question of how big the US penetration testing market is; of how big the global penetration testing market is; of how big the global security assurance market is; and various other slicings and dicings of the data. One of the more interesting questions that came up was whether a high-level percentage figure could be identified to then provide a sense of the security-relevant market potential of new areas of development. I thought I'd play with some numbers and see what popped out, and decided to share it here to solicit thoughts from anyone else interested in the topic. It's important to note that this is definitely not an economically or statistically rigorous approach to the topic; but rather is taking a handful of numbers and smashing them together to see what pops out, and to see if perhaps there's a meaningful trend that we can interpret. Whereas my analysis of the penetration testing market was bottom up, when we're looking at something the size of the global IT market, it's simply too big to do that way, so we need to start from the top and work down. At the top, we have some really big numbers. Gartner has estimated that the worldwide spend on enterprise IT was $2,700 Billion in 2012. (Note that I'm not entirely sure whether this figure includes or excludes personnel costs, which could throw a spanner in the works for the rest of this piece... but just go with it for now). If 5% of the $2,700 Billion market was spent on security, that would give us about a $135 Billion IT security market. At first glance this looks high, since most estimates have the security market at between $75-100 Billion, but one notable difference is the inclusion of internal staff - "personnel" - in that figure. Adjusting to take that out, the market size becomes $98.5 Billion, which is spot on with most other estimates. Could just be luck, but it's a nice starting point to at least have a little internal consistency in our numbers. Taking it one step further, the consulting figure (9%) would imply a consulting market size of $12.15 Billion, which seems pretty reasonable (for comparative data points, IBIS World has the Australian IT Security Consulting market at $2 Billion, and the US IT Security Consulting market at $5 Billion, so to add another $5 Billion for 'rest of world' seems about right, and hey presto... same number). Security assurance activities are mostly going to fall within the 'consulting' bucket, but there will likely be some cross-over. Some companies have internal penetration testing teams (so it would fall into 'personnel'), others will spend big on automated scanners and the like (so it would fall into 'software' and 'hardware') and others may categorise it as some kind of managed service (which would put it into 'outsourcing'). My estimate would be that at least 30% of IT Security Consulting spend goes towards security assurance activities. So that's 30% assurance of 9% consulting of 5% of enterprise budget of $2,700 Billion, and crunching that all together gives us a figure of about $3.65 Billion as the security assurance consulting global market. (I think it would be higher if associated products like vulnerability assessment tools/scanners and the like were included). The good news is that this figure is also pretty well aligned with other research out there about market sizing. It's also notable that the budget figure we're using - 5% - is from 2010. More recent estimates have thrown out numbers that range from a little higher (5.6% - FT.com 2011) to a lot higher (7.5% - Wisegate 2013). The 7.5% figure would make the security assurance consulting global market closer to $5.5 Billion, which is plausible, but probably stretching it a bit so I'm inclined to be conservative and stick with 5% as a macro-level average... but certainly note that as budgets rise, there is a substantial impact on the security market. To go from the macro- global level, to a country level, let's look at Australia and see what happens. Borrowing a data set from SMS Management & Technology's market presentation, their merger of data from Gartner, Forrester, and their own analysis, puts the Australian enterprise IT market size at $47.1 Billion. Note that this excludes personnel costs. 5% on IT security would mean $2.355 Billion. Adjusting for the personnel missing, and then just taking out the consulting chunk, we would have an IT security consulting market of about $340 Million, and a security assurance consulting market of about $100 Million. That's lower than I've previously estimated from a bottom-up view (my estimate is $200-300 Million) but I think in part that's a function of the fact that we actually have a pretty substantial and dynamic security assurance market in Australia, which could easily account for 50% of the consulting spend rather than 30% that I've apportioned globally. The final leap of faith here is to look at the ultimate 'trickle down' from a macro level market size, to the security assurance consulting market we are operating in. And the magical number appears to be something in the range 0.14% - 0.20% of a macro level IT market size, trickles down to security assurance. Mobile Ecosystem - Tablet market ~$35 Billion, Smartphone market ~$150 Billion, Application market $25 Billion - implied security assurance consulting market $300 - 400 Million. Internet of Things - IDC estimated market size $4.8 Trillion (Read that number again. That's Trillion.) - implied security assurance consulting market between $6 - 10 Billion. I'll leave it there. Partly because I have to go and start an Internet of Things security company right now. All reports referenced below, and all quotes, are from Seeking Alpha - free registration required to read them. In this first set, I've looked at Symantec, Checkpoint, and Fortinet. In later blogs I'll look at others including Sourcefire, Qualys, Imperva, Websense, Vasco, and probably some others. Symantec is like the New York Yankees. Big budget, used to win the World Series routinely, now has an ageing roster who spend lots of time on the DL, but somehow seem to still find a way to genuinely compete. Not a bad team, even if they don't look as razzle-dazzle as they once did. Checkpoint is like the Oakland Athletics. A good team in a smaller market (compared to the Yankees), that historically has focused a bit more internally than externally (with pretty good results most of the time). Fortinet is like the Washington Nationals. Lots of brash young players with extraordinary talent, who occasionally play the game too hard (eg http://mlb.mlb.com/video/play.jsp?content_id=27097807&c_id=mlb). But the fact is, a few years from now, when the Yankees roster is completely different, the Nationals roster will be much the same, and they will be awesome. Don't follow baseball, so don't understand the above? For more color, read below. Oh, and you'll also discover the joy of the word 'color' as a tool of management-speak. "We delivered better-than-expected results for the quarter and year... We grew 3% organically, the largest organic growth rate in 5 years." I can't help but think that when 3% organic growth is the largest rate in 5 years, the company is in need of some electro-shock therapy. "FY '13 also was the start of the transformation of Symantec." Ah, right. The aforementioned electro-shock therapy. "We're in the middle of rightsizing our management structure." Do people still euphemistically use the word rightsizing? Are we not supposed to notice that nobody has ever 'rightsized' a team and made it bigger? "We expect to eliminate between 30% and 40% of our management positions." Like I said. Rightsizing is a one way street. "We will have fewer, bigger jobs for our best and brightest. We are also attracting world-class talent from the outside..."
OK, so 30-40% of management positions are gone, and of the positions remaining, externals will take some, so we're basically saying that probably a full HALF of Symantec's management will be removed in the coming year. Wow. "...[we're seeing] double-digit growth in our information security business"
"...[we're seeing] double-digit growth in Business Critical Services as demand for high-touch infrastructure protection services continues to grow"
"...[we're seeing] double-digit growth that we're seeing out of areas like encryption, Managed Security Services." "Our Trust Services business continues to grow very nicely for us." "...as to the Endpoint Security business, that's closer to flat." Realistically, nothing too surprising here. Many of the fastest growth companies in the market are in the 'detect' space right now (rather than 'protect' or 'react'), and Managed Security Services and infrastructure protection services are growing well everywhere. It would be a tough part of the market to try to operate in, to cover both mums-and-dads anti-virus all the way through to high-end MSS for financial institutions. "In the first quarter, revenues reached $322.7 million, representing an increase of 3% compared to $313 million in the first quarter of 2012." As per Symantec, growing at 3% in a market growing 6-10%, isn't great... but of course that's always part of the challenge of being the big guy. It's much harder to grow proportionally as quickly as all the start-ups nibbling at your market. And of course Symantec is much bigger still. "Revenue distribution by geography for the quarter was as follows: Americas contributed 45% of revenues; Europe was 38%; and Asia Pacific, Japan, Middle East and Africa regions contributed the remaining 17%." This matches up pretty well to the rule of thumb that the Americas (primarily the USA) accounts for close to half of global cyber-security spend. "Competitive-related, no, I don't think that any of these deals -- I mean, all these deals that there are now are still open, and I think that, that part of the market is currently not very competitive to keep the deals we are seeing." This doesn't surprise me. As 'hot' as the security market is, and as many companies are pouring into it, it is still the case that a large part of security spend is not allocated through a competitive process; or if it is at first, it is not for some period of time after that. Organisations are - in many cases - picking their security partners and sticking with them, until or unless there is an unequivocal reason to change (with a major breach being a big one). "I don't think that there's any new competitors. Our market is competitive and always been competitive." "...some of that around mobility and data security, these are definitely areas we're working on and this is an area that will show some nice innovation during the rest of the year. So this is clearly an area that we are working on. " "Threat Emulation is an exciting blade, which addresses a very fast-growing segment of the marketplace. " "We just announced it a few weeks ago, and very, very new. In terms of how our solution is different. First, I think our immediate competitors don't have something comparable to that, and I think the unique value that we provide in the Threat Emulation space is the fact that it's all integrated into one system and the fact that we actually have prevention. If you look at many other emulation kind of solutions, they analyze the files pretty much offline, and if there is a threat found, then manually, someone had to go and look for the file. What we have is a realtime in-line system. You get an e-mail. If the e-mail is unknown, if the e-mail is not recognized... we'll take that e-mail, send it to the Threat Emulation engine. The Threat Emulation engine, by the way, can be a cloud service that we provide or it can be an appliance that a large enterprise would like to install locally. It runs the document in the sandbox, looks for the different behaviors, and then it either tells the main system, pass the e-mail, nothing was found, or it tells the e-mail something was found, stop the e-mail, don't transfer that. And that's a very, very powerful thing. Again, none of the other competitors has a realtime system like that." This is definitely a part of the market that every major security vendor wants to be in. The rapid growth of the segment (which didn't really exist just a few years ago), and the success of companies and products such as FireEye, RSA NetWitness, Solera, Sourcefire FireAMP and more, makes the only real decision for companies like Checkpoint, McAfee, Cisco and Symantec: Build or Buy? "...we did not see a major change in the competitive environment and no significant deals were lost to competitors." See comment in Checkpoint analysis about the nature of the competitive environment. Yes, it's crowded. Yet, it's competitive. But that doesn't mean a huge amount of business isn't being locked up without too much competitive conflict. "So we believe the security industry remain healthy, though growing at a slower rate than what was previously estimated. On average, research firm have the growth rate of now secured to be somewhere between 6% to 10% year-over-year"
A good stat to baseline growth against. "Fortinet hold more certifications than any other security vendor"
I have no idea how to test/validate this, so I'll accept it as is. An impressive statement given their relative youth in the market. "On the innovation front, we introduced a new product that strengthen our advantage across our core market. This includes a new FortiGuard cloud-based sandboxing and IP reputation service, designed to help protect against advanced persistent threats. Using behavioral attributes to detect malware by executing them within a virtual environment." See above commentary re: Checkpoint's Threat Emulation system. I'm actually not sure who was first into this market, and it's too early to say who is best, but regardless, expect it to feel like Attack of the Clones in the next 12-24 months. "we also continued to invest in sales headcount and marketing activities to support long-term growth"
See Symantec. There are going to be a bunch of sales managers available pretty soon. "Q1 billings were $148.5 million during the first quarter, an increase of $11.5 million or 8% year-over-year." That's a bit healthier. Nicely done. "EMEA billings grew 8% despite the continued macro uncertainty there. And APAC grew very nicely at 25% with good traction in Japan, Southeast Asia and India." Wow. 25% is indeed a very healthy growth rate. Not sure what the base was, but shows there is still a pretty significant unsatisfied market need. "In the Americas, we won a 7-figure deal with a large U.S. based wireless carrier where we replaced Palo Alto Networks. We were selected because of our superior reliability, scalability and overall firewall performance." "[on a different deal]...we beat out Check Point, Juniper, Palo Alto Networks and Cisco in this deal, based again on performance and breadth of functionality we offer..."
"[on a different deal]...we beat Cisco, Check Point, McAfee and Blue Coat in this deal..."
These statements are interesting because Symantec and Checkpoint seemed to not really want to name or discuss competitors at all. 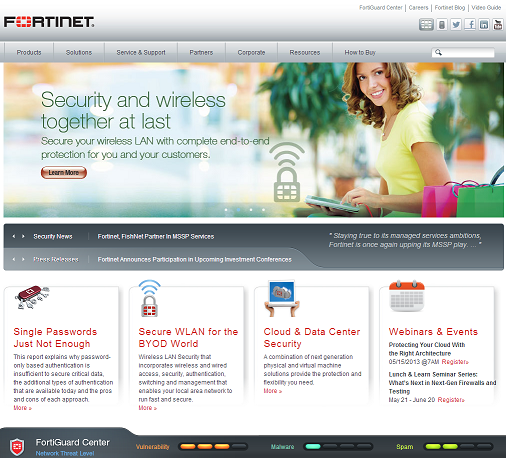 Whereas Fortinet just get straight into competitor-smack-down. As Robbie Williams says, "sing when you're winning." This one was everywhere. Seven appearances in the transcript, and they weren't talking about the flashing lights on the firewalls. I read it in the Checkpoint discussion too (3 appearances) and Symantec (2 appearances). Sounds like the latest buzzword. Excellent. It seems that "can you give us some color about..." basically means "can you give us some detail about..." But the people who say the former, rather than the latter, I assume get well rewarded for their command of management linguistics. Is it just a coincidence that the more the word 'color' is thrown about, the higher the company's year-to-year growth? "In terms of the strategy, I think the strategy is pretty obvious. Look, the product is advantaged in one particular context, and that is, it can do more with higher performance, far more reliable, far more scalable." Great clarity. You don't get that a lot. Penetration testing market analysis: where is all the revenue? I was recently sitting at the Australian Technology Park having a cup of coffee with Casey Ellis, co-founder of Bugcrowd, chatting about upcoming investor presentations. We worked our way on to market sizing, and found that we had both had the same experience when attempting to do a 'bottom up' sizing of the penetration testing market in Australia. The problem that we both came across, was that even using fairly conservative numbers as to the amount companies are spending on penetration testing, the amount of theoretical penetration testing revenue sloshing about in the market simply does not align with the revenue of the service providers in this space, or simply with the number of testers providing these services. Let's start with the big guys. Of the ASX20, which includes companies in financial services, materials/mining, energy, consumer staples, telecommunications and healthcare, my back-of-the-envelope estimates would suggest that the biggest spenders would spend about $4 million annually on penetration testing, and the lowest spenders would spend about $100K annually. Putting together the expenditure of the whole group, I estimate it works out at pretty close to a neat $20 million across the 20 companies. And of course, the ASX20 is - as its name suggests - just the 20 largest companies by market capitalisation on the ASX. There are a total of 2,157 companies listed on the ASX (when I downloaded the list a moment ago), all of whom you could argue have some degree of obligation to their shareholders to ensure the security of their data and systems, with penetration testing being a pretty common response to that obligation. For argument's sake, lets say less than half of them do anything, so 1,000 companies. And let's assume that averaged across that many organisations, the average spend on penetration testing is $50K per annum. That's another $50 million into the annual penetration testing market. I'd estimate that about 60-70% of the ASX20 spend is coming from the financial services companies in the group who were some of earliest adopters of penetration testing as a service, and continue to be the 'anchor tenant' for the industry. According to APRA, at the end of 2012, there were 19 Australian banks, 8 foreign subsidiary banks, and 40 branches of foreign banks. On top of these, there were 91 credit unions and 9 building societies. There are also a handful of 'miscellaneous' companies like payments clearing, 'specialist credit card institutions' and 'purchased payments facilities' who are also significant market participants. So that's an extra 170-ish financial services companies who are probably getting penetration testing completed to a greater or lesser extent. Even if we rule out the 'branches of foreign banks' (as many of them will have their penetration testing managed by the global head office and hence delivered from overseas), we've still got about 130. Chop out the group already counted in the ASX20, and we've got about 125. Now let's be super-conservative and say that they will spend only 10% of the amount that the larger companies will spend; or a meager $100K per institution. That's another $12.5 million into the annual penetration testing market. Take a moment to consider that according to the Australian Bureau of Statistics, at the end of the 2010-11 year, there were over 164,000 businesses in Australia classified as 'financial and insurance services'. In the calculations above we covered about 200 of them; admittedly the biggest, but it still leaves a vast number who have data to protect, and some of whom certainly have some penetration testing done. (If just 2% of them spend just $5K each, that's another $15 million into the budget). As per policy, each of these needs at least annual independent penetration testing. Let's use our average across the set (covering both infrastructure and applications) of just $20K per annum. That gives us about another $6 million for our penetration testing budget. To avoid the pain of digging out the numbers for all the other states and territories, let's make a broad assumption that all the other state and territory governments added together, sum to three times the size of Victoria's, in terms of Internet-facing infrastructure (which given it include NSW & QLD, plus the rest, seems reasonable). Let's also assume that they have a similar intent to test everything annually. So that's another $18 million to the budget. That number feels high, so let's include all local government, councils etc across the country as well in that figure. And of course there is also Federal Government. 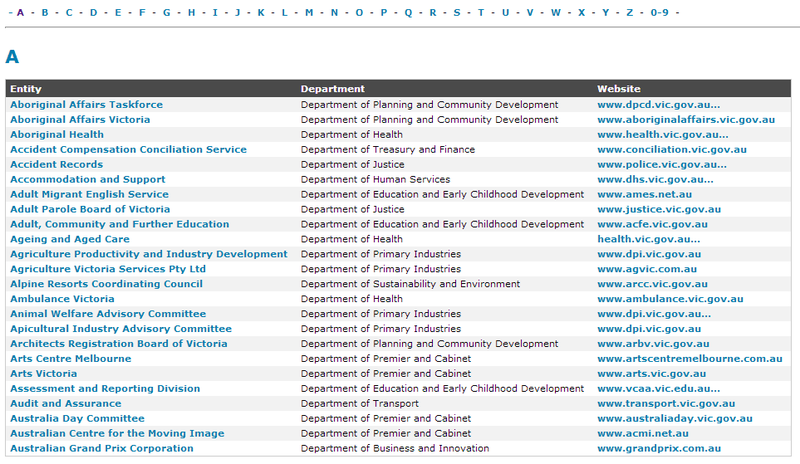 It's possible to download a list of all registered contracts with keywords like 'penetration testing' or 'security testing' at https://www.tenders.gov.au/?event=public.CN.search, but these lists are woefully incomplete when trying to get a picture of the size of the market. The Federal Government side of things is also somewhat obscured by the fact that at least some of the vulnerability assessment and penetration testing completed is performed by the Defence Signals Directorate (DSD). Rather than tie myself in knots trying to work it through, I'll take a short-cut and assume it's the same as Victoria: $6 million annually, across all government agencies including the Defence Department. The Payment Card Industry Data Security Standard (PCI DSS) requires penetration to be completed at least annually for in-scope systems and organisations. There are approximately 200,000 websites in the .au domain space with 'shopping cart' functions. Mmany of those will be using PCI compliant externally-hosted shopping carts so probably don't get penetration testing completed themselves. But let's say just 10% of e-commerce websites with 'shopping cart' functions get penetration tested each year. That's 20,000 websites. Most of these are probably pretty small, so let's say they are just $10K penetration tests. That's another $20 million in the budget. We'll assume that the vast number of companies covered by PCI DSS, but who don't have a distinct 'shopping cart' function so aren't included in the figures above, are covered elsewhere in one of the figures we've already looked at. There are 44 universities in Australia, and another half-a-dozen miscellaneous self-accrediting higher education institutions (ie theological colleges, maritime college etc), giving us a nice neat 50. There are then at least another 100 state and territory accredited educational organisations, plus TAFEs and the like. There are thousands of schools. Given universities'... errr... 'creative' student population, they have a bigger need than most of the others here. Let's assume $100K per annum for the universities, which is $5 million in total to the budget. For the thousands of schools, TAFEs, and other miscellaneous bodies, it's hard to know where to start, so let's just allocate the entire sector $25 million and be done with it. If there are 5,000 schools across the country that's only $5K of testing per school, so pretty conservative, although I'm cognisant of the fact that far-flung country-shed classrooms are unlikely to be having this testing done. One of the larger consumers of penetration testing services is the broad and large ICT industry - and in this I also include companies developing software for sale to others, who therefore have a requirement for security assurance of that product prior to taking it to market. It is also the fourth largest industry sector contributing to Australian GDP and employs 291,000 people in Australia. According to the Australian Bureau of Statistics, at the end of the 2010-11 year, there were 18,854 businesses operating in the Information, Media & Technology classification. Let's just say 1% of these companies, spend $100K annually on penetration testing. That's close enough to another $20 million. And we haven't even touched industry sectors like healthcare, resources (in the midst of all the 'China APT' news), legal, accounting, professional services, let alone the hundreds of thousands of small and medium sized businesses in this country, at least some of whom are spending some money on penetration testing. So using this logic, there's a spend of something like $200-300 million on penetration testing, annually, in Australia. Given the massive slabs of Australian business that are not covered in the figures above, even with the odd wayward assumption or double counting here and there, it seems reasonable. And this is where the trouble starts. Where is it going? Taking the 40% figure, we'd be looking for a company with $80-120 million in penetration testing revenue, annually, in Australia. They don't exist. No big deal, it just means we don't have a company with 'substantial market power'. Taking the 25% figure, we'd be looking for a company with $50-75 million in penetration testing revenue, annually, in Australia. They still don't exist. So we don't have any real competition concerns in the market, which is healthy. For argument's sake, let's take a 10% figure, so we'd be looking for a company with $20-30 million in penetration testing revenue, annually, in Australia. I'm still doubtful any service provider in Australia operates at that level. If I'm right, and there is not a single company in Australia with 10% of the penetration testing market, who is delivering all these penetration tests? Or is it that the numbers above are fundamentally incorrect because organisations just don't do as much penetration testing as they should (under policy, regulation, best practice etc)? Let's take another angle on this. Using $200 million as the market size, and a pretty standard average consulting rate of $1,500/day, there are about 133,333 days worth of consulting-level penetration testing to be delivered each year, which would require about 610 full time penetration testers in service provider organisations. They aren't there either. One thing I am confident of is that there is also an extremely long tail when it comes to suppliers of these services. That is, there is a very large set of companies who each provide a very low portion of the services overall consumed in the market. A great many miscellaneous ICT service providers (of which as per above there are many thousands) provide security related services such as penetration testing to their existing client base, with varying levels of quality. Because of the large numbers, if 1,000 of these companies provide $100K of penetration testing services each, that could make up $100 million of the market total. Another interesting question is how big the market would be if everyone was following 'best practice'. At present, there is far from anything like consistency when it comes to the amount that organisations are spending on IT security, let alone on a sub-set of the topic such as penetration testing. Near-identical banks can quite plausibly be spending amounts on penetration testing that are out by a factor of 10. Where one bank spends $2 million; another spends $200,000. There are also a great many companies - including those no doubt in lists like the ASX 200 - who simply do not have penetration testing completed at any meaningful level. If all Government agencies were following policies and had every system tested annually; and all PCI-relevant organisations had penetration testing completed annually; and all ICT companies had their software and hardware tested before releasing it to market... etc, then the figures above could easily double to $500 million plus, annually. So we have a $200-300 million market (much of which is probably only now coming to market for the first time), with a half-billion dollar opportunity, with no company in a position of market dominance, and an under-supply of qualified penetration testers to deliver the services. Pretty compelling. Want to buy a penetration testing company? Call me. At Delling Advisory, we believe that we can provide the best advisory services to our IT security industry clients, through having an unsurpassed understanding of the market, both from first-hand experience having started, built and run IT security companies, as well as from access to unique data and analytics. This year, we have collated the data on about 650 cyber-security related transactions around the world, dating back to 2004. A significant amount of work has been completed to categorise each transaction based on the 'company type' of the acquiring firm, as well as the security-related services that the acquiring firm previously provided and that the target firm provided (professional services / hardware / software / managed services), the country of origin of the acquirer and target, as well as the financial details of the transaction where that information is available (either publicly or via our industry contacts). An early version of this data set is graphically represented in the map at the start of this post - blue being the acquirer and yellow being the target of the acquisition. Over the next few weeks, we will start presenting snapshots of this information, to provide a high-level picture of the trends and directions that have taken shape over the last decade, with respect to the cyber-security market. Obviously there is a significant amount of proprietary data that we have compiled through this process, and we use this information in our advisory roles to better understand and communicate the state of the market, as well as valuation trends and trends in the 'buyer universe'. To get started, a couple of initial data sets. Q. Who is buying all these cyber-security companies? In short, many different companies (and 'company types') are acquiring cyber-security companies. The defence industry has been in the media for the last few years as one of the most significant buying groups, but back to 2004 they only account for about 12% of all transactions. Just taking the years 2010 to 2012, when transaction volume was highest in the defence sector, those firms still only accounted for about 18% of transactions (since although their transaction volume went up significantly, so did everyone else's). The most prevalent acquirers of cyber-security companies are now (and have been every year since 2004), other cyber-security companies, and other IT companies seeking to expand their security-related offerings. The heavy acquirers - as can be seen from the transaction map at the start of this post, have tended to be companies such as Cisco, McAfee, Oracle, CA Technologies, Symantec, IBM, Microsoft, EMC Corporation and Dell - although the defence primes Raytheon and BAE Systems have also made a dent. Q. Are transaction volumes sky-rocketing? Not really. There are certainly many more cyber-security related transactions now than there were in 2004... but there are many more cyber-security businesses now than there were in 2004. In broad terms, from 2009 onwards, transaction volume has been about 50% higher than in the period 2006 to 2008. Cyber-security has become very important to a lot of companies, very quickly. As a result, and given the difficulties in recruiting cyber-security professionals, adding this capability by acquisition continues to be very attractive.